A dorsal mid line fusion defect in lumbo sacral region. Herniation of meningeal sac out the defect forming a subcutaneous swelling. Low lying tethered cord with neural elements noted traversing the meningeal sac. Focal dilatation of central canal of cord. Syn: MMC, myelomeningocele, open spinal dysraphism, spina bifida aperta, spina bifida cystica. Location: Lumbosacral (44%) > thoracolumbar (32%) > lumbar (22%) > thoracic (2%). Size varies depending on extent of neural tube defect. Xray: Posterior spina bifida with wide eversion of lamina. MRI: The investigation of choice. 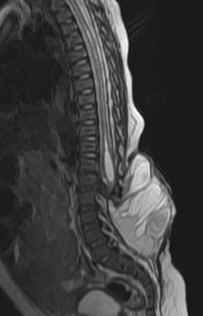 Dorsal mid line fusion defect, wide spinal dysraphism, flared laminae. Loss of normal posterior epidural fat segmentation at the level of anomaly on sagittal sections. The posterior epidural space is wide with contiguous epidural fat. Nerve roots traversing the dural sac originate from ventral placode surface. Rest of the whole spine screening and brain needed to rule out associated abnormalities like Kyphoscoliosis, vertebral segmentation anomalies, Diastematomyelia, dermal sinus, Syrinx, Chiari II malformation in ~ 100%, hydrocephalus.